What a week it has been. Clearly life is not meant to slow down - even when you have an empty nest. Last week we moved our last daughter into her dorm room and headed off to our church family camp. My sister and I were in charge of putting together an activity for the weekend. We chose The Amazing Race. It was a huge scavenger type hunt that involved physical activity, mental activity, and of course, eating weird foods. Overall it turned out well, but I think it was too intense and too structured for some of the people at camp who simply wanted to relax. And it was totally exhausting for my sister and I. But we got up at 5:00 am on Sunday morning and drove the 3 hour trip home so I could attend some of the parent/student events at the University with my daughter. I'm really glad I did that because it was important that I be with her that day. Being so tired from the weekend didn't help me emotionally. It has been a hard week facing her leaving. Some of you know that she is only 25 miles away from home living at the University that I work at. But I can't tell you how different our home feels. It's all good. Just different. Then I started school. I signed up to take a Magazine Writing class. It's an upper division class and I don't think I knew what I was signing up for. My professor said on the first day that it is a goal of the class to be published by the end of the semester. That seems doubtful to me. But I'm going to give it my best shot. It's a bit intimidating to be a 49 year old in a class of 20 year olds. It's a bit uncomfortable being older than the professor. Oh well. We are actually going on a field trip next week! That just cracks me up. Next weekend I'm hosting my daughter Andrea's baby shower. Have you noticed the little ticker up there showing how close she is getting. Only about 4 more weeks until I get to hold little Ava Claire. I am excited beyond words about that. My poor Andrea started her kindergarden class this week. Can you imagine teaching kindergarden for the first time being 8 months pregnant? Yesterday was her first day and she said her feet felt like stumps. I'm spending my Labor Day weekend working on my quilts for her shower. I know I'll get one down but the second one might have to be wrapped unfinished to be finished later. 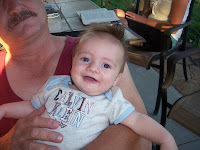 Oh and my little Tyler got his first haircut. Imagine, three months old and getting a first haircut! He is such a kick. His hair really just stands up like this all by itself! He is such a good little baby. And he knows me now! When he sees me he breaks into the biggest smile and snuggles his head into my shoulder. Talk about turning into a puddle of mush. He is the most snuggly little guy you could ever imagine. And then to top it all off, I purchased an airline ticket to go to Washington DC with my sister for a week at the end of October. Yes, I'm flying again. Darn it. But I have an opportunity to go with her on her business trip and it's not going to cost me hardly anything. My ticket was paid for because after my fiasco on the flight to the She Speaks conference I was given a voucher from the airline to pay for it. I can stay in her room free and her eating stipend is enough to pay for both of us. How could I not go? My husband made an observation this week. He commented that all of our family members are in transition of some kind of another right now. And it's true. He and I are adjusting to an empty nest. Michelle and Brad are adjusting to a new baby. Jayson and Andrea are adjusting to new jobs, full-time school for Jayson, and a new baby arriving in 4 weeks. Tara is adjusting to her new internship in San Francisco, and Jessica is adjusting to college. Whew! I'm thinking we are really going to enjoy that Florida vacation come Christmas. Okay, I'm really tired now - just writing about all that's going on! Have a wonderful Labor Day weekend - I hope it's restful for all of us. 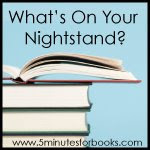 Last month I joined up with the 5Minutes for Books blog to report on what I intend to read and what I do read every month. Then I give a little mini-report on each book I have read. So last month I posted this picture. The books on the left are the books I intended to read. Overall I did pretty well. Keep in mind it is a woman's prerogative to change her mind. Peace Like a River by Leif Enger. I had heard so much about this book and have been wanting to read it for a long time. It is very different from the style of book I normally read and I really enjoyed it. It has a captivating storyline and incredible writing. Mr. Enger has a gift of stringing words together that paint masterpiece style portraits. It's worth reading just to enjoy the excellent writing in it. The Trophy Wives Club by Kristen Billerbeck. Overall, I was disappointed with this book. 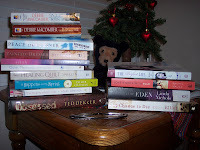 I read Kristen's Ashley Stockingdale series and LOVED them. This book was just trying to be to edgy for my taste. I thought about it for a while to try to figure out why I didn't care for it and I finally realized it just had way too much sarcasm in it for me. Sarcasm and anger. The story is about a jilted Hollywood wife trying to come to terms with her new life. I guess I just couldn't relate. Sisterchicks Go Brit by Robin Jones Gunn. This one wasn't on my intended reading list, but I found it in the library so I grabbed it. I just love Sisterchick books. I love the continuing thread of God's grace that is woven into each story. I love the adventure. I love the friendships. And I love that each adventure in each book is a travel guide. If I ever go to visit any of these places that the books are about, I will read the book first. Robin has a real knack for visiting places that are not usually heard of. I love that kind of traveling. She really came up with a great concept for books. Dakota Born, The Shop of Blossom Street, and A Good Yarn all by Debbie McComber. These are the first Debbie McComber books I have ever read. I have a feeling I was the only woman left in America that would fit that description. I see them all the time in the grocery story and everywhere else. I finally picked up a few at the second hand bookstore and settle in for a good read. I liked the storylines. I liked the good strong characters. I liked the writing style. I was a bit surprised by some of the language used in the books as well as some of the shall we say, "initimate settings". I realize that although Debbie McComber is a Christian, she does not necessarily write Christian books. But I was still surprised. I'm not sure why she felt the need to use the words, the stories would have been just as good without them. Some might say that she is just "keeping it real". Okay. I just didn't care for it. But I do like series books. And I probably will read the rest of the books that will complete those series. But I probably won't read anymore after that. That's just me. Well, that's it for what I read. I still need to take a picture of what I intend to read this month. I'll try to update soon. They say the only certain thing in life is change. I wonder why then, change so often times seems difficult and challenging, as though it's something we have never faced before. Every day of our lives brings some type of change. An unplanned event, a detour on your normal route, getting a cold, spilling something on your blouse. You know the kind - just unexpected occurrences that cause us to rethink, re plan, refocus. Minor inconveniences that we deal with all the time. But some days life brings bigger changes. Changes that we knew were coming but somehow it seemed so far away that it didn't really matter. We would cross that bridge when we came to it. We arrived at that proverbial bridge this week. And the crossing of it is reminding me of why I didn't want to think about it before. We are moving our baby into her college dorm room tomorrow. And this change, well this change is hard. We just don't feel emotionally ready yet to cross this bridge. Our lives are changing big-time and Jess has said that she wishes we would have had more kids so she wouldn't feel like she is leaving us all alone. Me too Jess. Me too. Yesterday she packed up her bedroom. When I came home from work she had everything packed in boxes. She was crying. I was confused. "Jess, you aren't planning on taking everything from your room to your dorm are you?" "Storage? What do you mean storage?" "Well, you know, it's the stuff I don't want to take but I don't want to get rid of it either." "Well honey, why don't you just leave it here. In your room?" A blank look crosses her face. "You mean I don't have to move out everything?" I didn't know whether to laugh or cry harder! After talking about it with her I realized that her three older sisters never did return home after leaving for college. They either got married or moved across the country to go to more school. In Jess's mind, that is how it works. She felt that once she left she wouldn't be coming back home. Oh dear child - our address will always be your home. Always. So I helped her unpack the storage boxes and put the items back in her closet and on her shelves. So now her room doesn't look so bare. But I have to admit, based on her sisters before her, I fear she may never really come back home to stay again. And my heart can hardly handle that thought. Change isn't bad. It's just different. Our home will be different without her. Our relationships will be different as we adjust to parenting adult style. Our marriage will be different as we adjust to being alone with each other more than we have been in the last 28 years. But I wouldn't hold this girl back even if I could. She has so much promise and potential in her being that it is exciting to see what her future holds. God's hand is on her and He loves her dearly. His plan for her life is unfolding before us and I feel so honored and so privileged to have been a major player in the first part of it. She is so much a part of the both of us - she will do things I only dreamed of. So those of you who are taking your babies to preschool and kindergarten and first grade this week - my heart recognizes that aching that you are feeling. As you have been told so many times - enjoy these days - for they are fleeting. Love these days with your babies. Every now and then you will be tempted to look far into the distance and you will see the faint outline of a very large, seemingly formidable structure. It's shape will become clearer and closer every day and soon you will recognize the form of a bridge. Don't be afraid of it. It is supposed to be there. It is there for you to cross- it is strong and secure. Life on the other side of it will be good too. First of all let me apologize for the poor quality of pictures on this post. Yesterday we had our annual family corn pickin', shuckin', freezin' day and in all the draggin of my feet excitement, I forgot my camera. So these are from my husbands phone camera. Which is almost as bad as not having any pictures at all. But hey, I was picking corn for pete's sake. Every year a generous family in our church lets us come and pick all the corn we will need. So we load up the back of the pickup truck. Have you ever picked corn in a big field? It's not much fun. It's hot and humid. And the big long leaves on the corn plant seem to attack you. I can't tell you how many times it felt like they were slicing my face. And it's very hard to find your way back to the truck out of a big, high cornfield. And it always seems to me that if I were a big, long snake - a cornfield would be a great place to hide. Therefore, I am usually looking harder for snakes than I am ears of corn. My family just loves my productivity. After we pick the corn we drive right up to the pasture in our back yard. We have two horses and horses love corn shuckings. So we do all the shucking right there and make the horses very happy. Next we proceed to our church kitchen which is right across the lawn from our pasture. The church kitchen in very large and it works great for about 12 of us working like mad to get all the corn done. We have a system, oh yes we do. My mom and son-in-law took charge of boiling the corn and then dumping it into ice water. My husband and brother-in-law and me cut the corn off the cobs and my sister and two daughters bag it. My two neices Miah and Kaitlyn had the job of stacking the bags of corn into the refridgerator. They did an awesome job. As you can see they were very proud of their hard work. This group tried to convince us that they were part of the Quality Control Team. By the time we were done we had bagged 120 quarts of corn. And even though it was very hot and tiring work, this winter we will be glad we took the day to do it. And even though we moan and groan a lot it really is a fun time as we all work together. So is everyone as hooked as I am in watching the Olympics? I can't get enough of it. I don't remember watching the Olympics as a kid, in fact the very first and the most special Olympics I remember is the winter Olympics in 1980. My first baby had been born on February 10 and my mom flew out to take care of us and every evening we would curl up on the sofa in the living room and watch the US Hockey team and Eric Heiden and his sister Beth as they skated around and around and around that ice rink. And the ice skating - oh my - it was amazing to watch such beautiful graceful talent. I cried when Tai Babilonia and Randy Gardner had to withdraw because of his injury. It was such a happy time for me personally. That was when my love affair for all things Olympic began.There is just something amazing about watching people who are so driven and so talented and so focused on achieving a goal. I find it amusing that watching the Olympics makes a person want to start think about starting an exercise program. Oh to be so young again. And how about the 41 year old woman who won a silver in her swimming competition. You go girl! I think there is also an older man there competing with his son-in-law. But by far the Olympics belong to the young and the strong Michael Phelps' and Shawn Johnsons'. And it belongs to all of us who like to live our lives vicariously through them. My favorite events are the women's gymnastics. I love watching those girls do seemingly impossible maneuvers on all that equipment. My arrival time at work in the morning has been suffering greatly this week - I just can't get to bed on time - not when I have to see if Michael has won another gold medal. Not when I have to see if the US gymnastic team might outdo the Chinese. However, I do have some questions about the Olympics. Just some observations on my part. 1. Why do the women beach volleyball players wear next to nothing and the guys dress appropriately in shorts and tanks? Falling down in that sand with next to nothing on can't feel all that good. I'm just saying. 2. Who on God's green earth really believes those little Chinese gymnastic girls are 16? You've got to be kidding - I'm guessing they are between 8 and 12 years old. The announcers were saying their passports stated they are 16. Helloooo - can anybody say forgery? Why do we not push this envelope a little more? Why aren't we complaining more? 3. During the swimming competitions who are the men in suits who walk up and down the length of the pool and what is their job? 4. Does anybody understand the new gymnastic scoring procedures? Anybody? August 12. It is getting seriously close now to the end of summer. All the stores are advertising school supplies, swimming pools are posting their closing dates, and department stores have their fall and winter clothes on display. The problem is, I'm just not ready. And while I realize that the calendar does not pause to consider my personal feelings on the matter, it remains a true fact that I cannot get my mind to wrap around the idea of turning the air conditioner off or raking piles of leaves. So I'm not going there. Instead I am staying in the blistering warm land of the Beach Boys where my destination is Kokomo and I'll have fun, fun, fun 'til my daddy takes my t-bird away. Or it starts to snow. I have had a wonderfully productive few days in the "Making Things For Grandbabies" department. Let me just tell you - this could become slightly obsessive. It's just so much fun. I wouldn't have a problem at all quitting my job and just staying home all day sewing and knitting for my sweet babies. 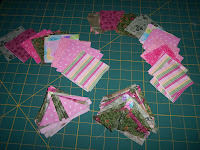 Here are some prairie points and fabric cut out and ready to sew together for Ava Claire's quilt. I love the colors - bright pink, soft pink, and green. It's nice that everyone knows she is a girl so I don't have to keep everything a secret like I had to for Tyler. 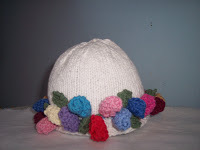 I just finished this little hat for Ava Claire. It's from the Itty Bitty Hats book by Susan B. Anderson. Anyone who loves to knit for babies must have this book and it's companion Itty Bitty Nursery. There are so many cute baby things in it - the hardest part is just choosing what to make. I'm looking for some blue and orange yarn to make a special hat for Tyler - his daddy loves the BSU Bronco's - and the first game is August 30 - yikes! I need to get started. 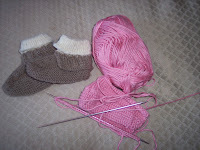 I knit these little moccasins for Tyler and now I'm working on a pink pair for Ava Claire. They knit up really quick and are just adorable. 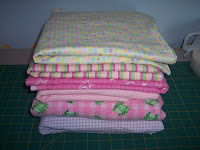 Here's some flannel all washed and ready to sew into little receiving blankets for Miss Ava. I made a dozen or so of them for Tyler and his mama tells me she wouldn't know what to do without them. Sometimes it's the most simple things that work the best. Don't you just love that pink fabric with the green frogs! Miss Ava's nursery is decorated in ducks and frogs so I think her mama will love this one. And here is a package I just got in the mail. 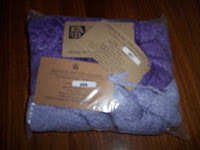 Some of the softest yarn I have ever touched. And I can't wait to finish up a few of the other projects so I can get this purple yarn on my needles and start working up a little something special for Miss Ava.